302 pages | 8 B/W Illus. Austrian Economics Re-examined: The Economics of Time and Ignorance is an expanded version of the 1996 edition of The Economics of Time and Ignorance. This work is a classic statement of the role of subjectivism, radical uncertainty and change through real time in Austrian economics specifically, and in modern economics more generally. The new book contains the full text and Introductions of the earlier edition as well as the comprehensive previously-unpublished essay "What is Austrian Economics?" and a new Introduction. The essay is a comprehensive overview of the central themes of the book from a somewhat different perspective than in the book itself. It supplements the analysis in the book. The new Introduction explains that the 2007-8 financial crisis and recent developments in behavioural economics have made the book more relevant than ever before. Austrian Economic Re-examined develops and systematizes the fundamental principles of the Austrian tradition to the analysis of rational expectations, business cycles, monetary theory competition and monopoly, and capital theory. 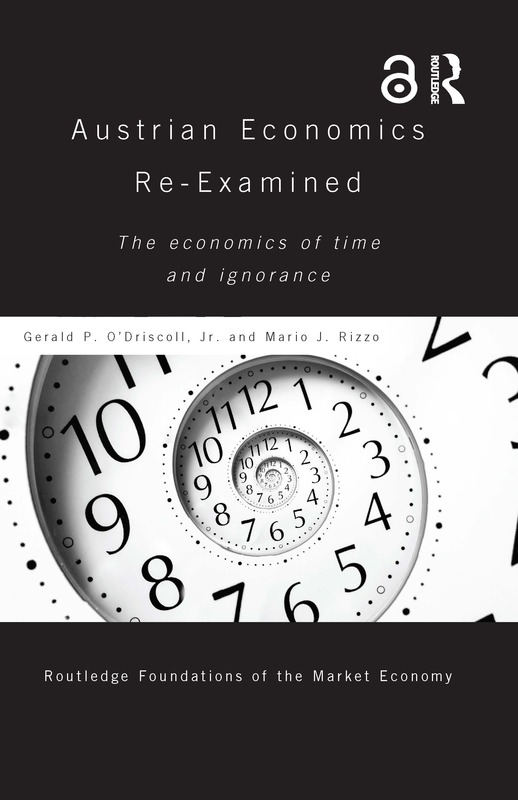 When it first appeared in 1986, O'Driscoll and Rizzo's The Economics of Time and Ignorance was a signal event: a highly original explication of the main tenets of Austrian economics by two of the "new generation" of scholars. This volume, which carries a new introduction, gathers together in one place the 1980 paper that gave birth to the book, the text from the 1996 Routledge edition, a reprinting of Rizzo's 2009 New Palgrave article on recent work in Austrian economics, and O'Driscoll's "response to critics" that was produced for session at the 2011 Southern Economic Association meetings to celebrate, in good critical style, the twenty-fifth anniversary of the publication of the original book. I can think of few better introductions to Austrian economics. Bruce Caldwell, Duke University, USA. Austrian Economics Re-Examined is more than a reprint of O'Driscoll and Rizzo's classic The Economics of Time & Ignorance, it is an updated and expanded edition with new material that both contextualizes the research program of time & ignorance in the contemporary philosophical, political and economic scene, and suggests how to meet the new challenges head on for a new generation of a scholars working along these lines. Once again, O'Driscoll and Rizzo present the Austrian tradition as a living body of scientific thought, and economic theory as an invitation to inquiry. The work remains fresh, exciting and surprising -- like a fine wine, O'Driscoll and Rizzo's classic work has improved over time. A great achievement. Peter Boettke is a University Professor of Economics and Philosophy at George Mason University, USA. Part I. Introduction: A Changing World Part II. What is Austrian Economics? Part III. The Economics of Time and Ignorance Part IV. Austrian Economics: Recent Work Mario J. Rizzo Part V. Responses to Criticism i. Gerald P. O’Driscoll, Jr., "Twenty-Five Years After" ii. Mario J. Rizzo, "Foundations of the Economics of Time and Ignorance"
Mario J Rizzo is a Professor in the Department of Economics at New York University. He is also director of the Program on the Foundations of the market Economy and co-director of the Classical Liberal Institute at the New York University School of Law, USA. Gerald P. O’Driscoll, Jr. is Senior Fellow, Cato Institute, USA.